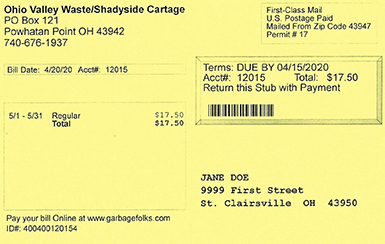 Ohio Valley Waste Systems, Inc.
Commercial Customers now receive a standard invoice for your records as well as a yellow postcard in order to return a portion of the stub with your payment. By going online, commercial customers can also review account history and important billing information. Residential customers now receive a yellow postcard for their monthly service. We heard from numerous customers that the former bills - which were white - looked too similar to local water and sewer bills, as well as other regular mail. We decided to add color and go “yellow” to help the monthly bills stand out. We hope it is easier to spot our mail now.